Coup! 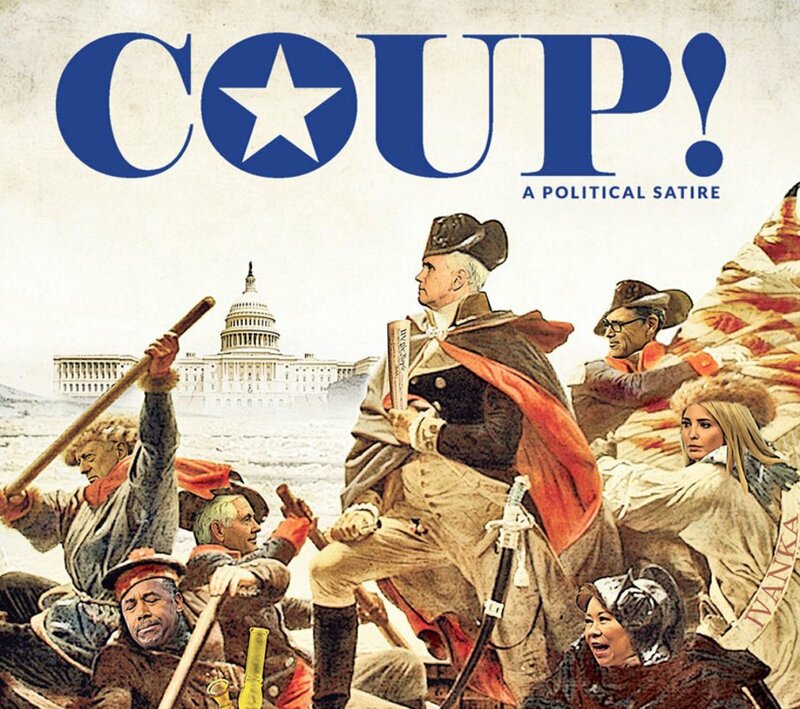 Serial satire uses imaginary Mike Pence coup to lampoon Trump's "presidency"
Gersh Kuntzman's serialized novel "Coup!" is notionally the memoir of a retired CIA operative ("Deep State") who, having discovered he had terminal cancer, decided to help Mike Pence invoke the 25th Amendment and stage a coup deposing Donald Trump and installing himself as President Handmaid's Tale, with a coterie of morally flexible billionaires who'd been bought off of Trump's cabinet with promises of special favors and steady leadership. It's a fun mix of fiction and fact, using all the materiel generously supplied by Trump and Co as the backdrop for a sometimes-broad satire that is literally ripped from the headlines. There's ten chapters online so far, with no end in sight (save, perhaps, by the overtaking of events in the form of an actual collapse of the Trump administration). The first volume is also available as a $4 ebook. Though Trump probably picked DeVos because he was attracted to her, Pence liked DeVos because her philosophy on schooling hewed very closely to Pence’s own: defund public education, use public money to support private and religious schools, break the teachers union, and inject religion into public life whenever possible. "OK, send her in," Trump said. "And get Bannon in here, too." DeVos entered, visibly upset. White House Counselor Steve Bannon — who looked like Robert Redford, if the actor had been fed a 30-day diet consisting solely of doughnuts, then drugged and then dragged across the bottom of a river — also entered, visibly annoyed at DeVos’s apparent exasperation. "Madame Secretary, Trump said grandiosely, what brings you to the Oval Office?"